Tales of Sheila's journeys -in India and around the world. For my childhood friend Jugnu and me - A day to remember! Late afternoon of April 2, 2017. We were on our sixth safari at Jim Corbett National Park, Ramnagar. 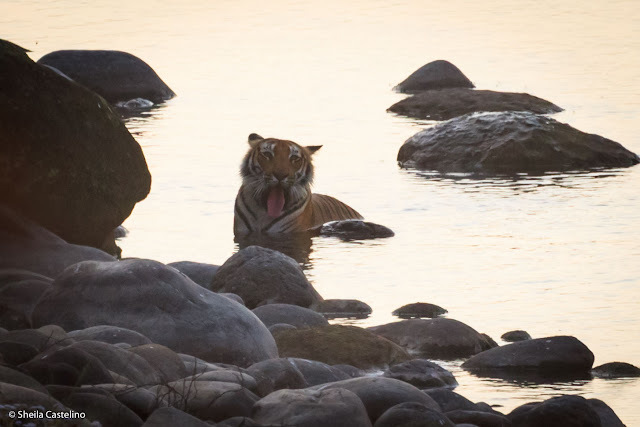 Earlier that morning we had missed sighting the tigress 'Paarwali' (so named - she who lives across of the river) during our morning safari. She has 'just crossed the road gone down in the bushes', we were told. An oft heard phrase! Quite disappointing. 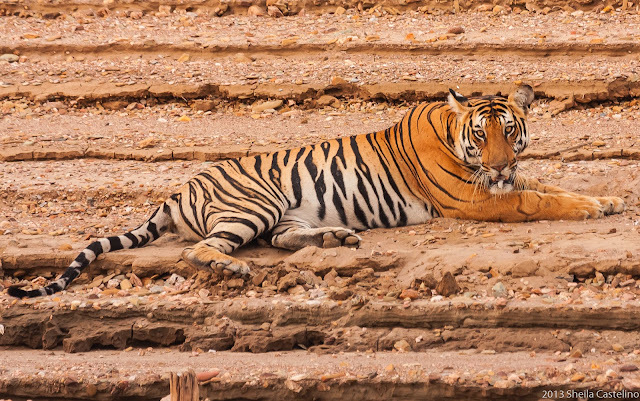 Later that afternoon, by the time we reached Sambar Road, where she had been sighted earlier in the day, there was already a line of up jeeps. Ours was the last Jeep, at the tail end. The wait for her to emerge began. An hour and more passed. 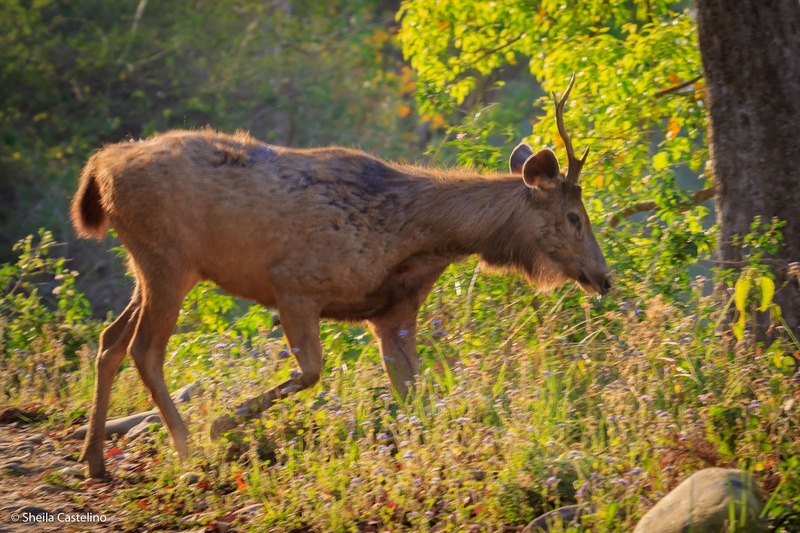 While waiting, we saw this 'one antlered' Sambar deer strolling along, eating grass and leaves. Clearly, the other antler must have broken during a fight. He turned around and looked at us curiously. 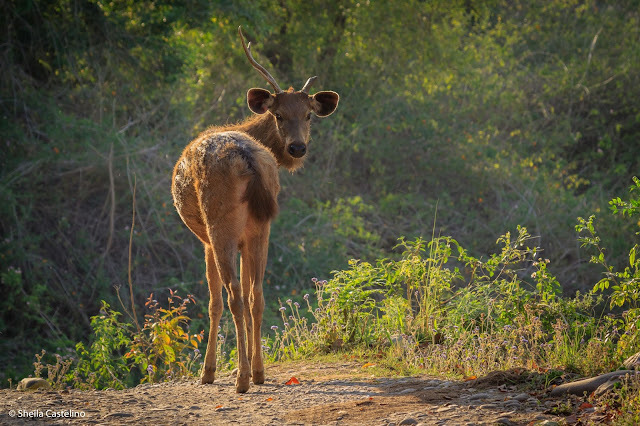 The Sambar deer turned and glanced at us curiously. A while later, the Sambar turned, and started going down, towards the river. It was a very hot afternoon. 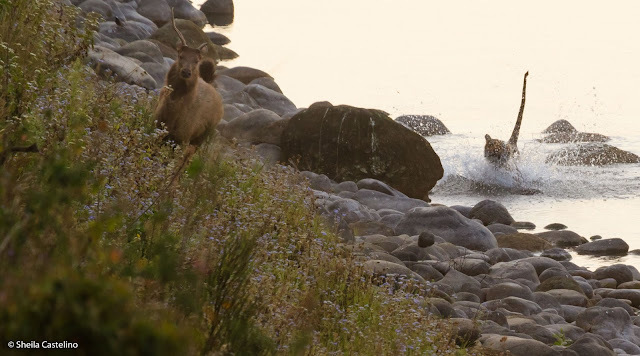 The thirsty Sambar deer turns to go down to the river. Our driver, Wasim was busy scanning the area. Suddenly he spotted Paarwali. 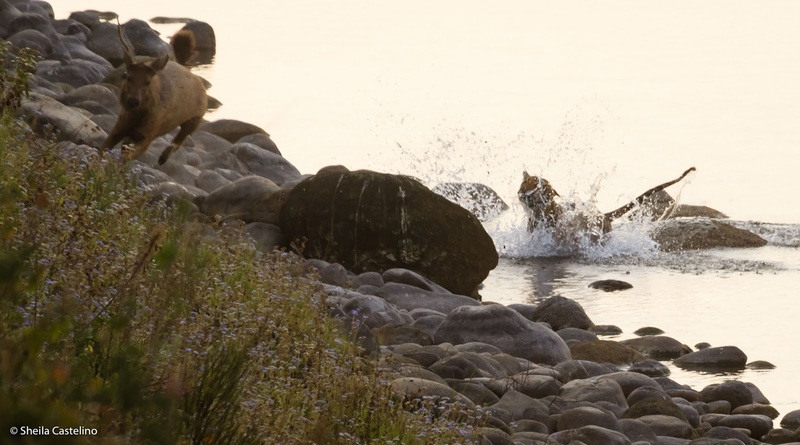 "There she is behind one of the small boulders in the water," he said. She has fooled everyone! She had moved, unseen, from her morning spot at the other end of Sambar Road to our side. We were facing the setting sun. It's rays bouncing off the waters of river, was making it even more difficult for us to see anything clearly. 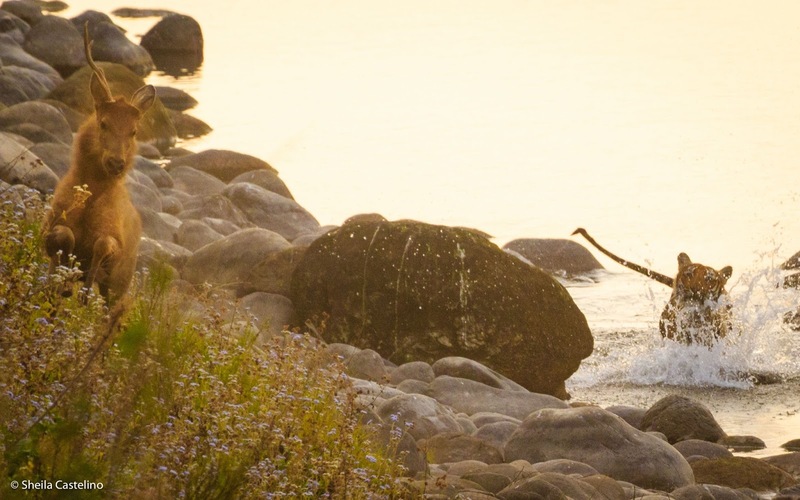 All we could make out were silhouettes of the boulders in the shimmering waters. We were at a fair distance, from the waters edge. Try as I might, I just could not see 'Paarwali'. 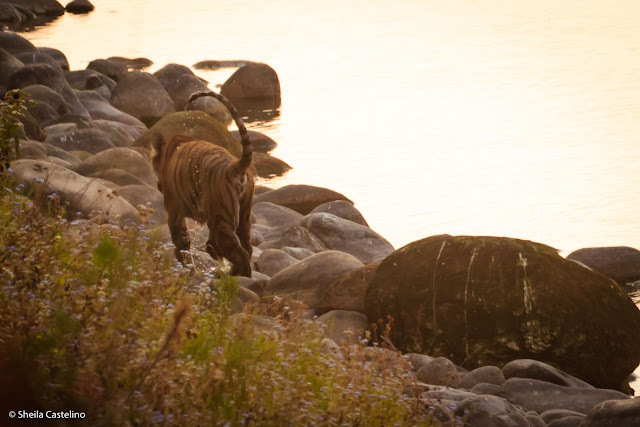 The unsuspecting Sambar moved towards the waters edge, while Paarwali watched him. Can you spot her? By now there was much excitement around, as everyone wanted to see the hidden tigress. From being the last jeep in the line up, we were now the first! 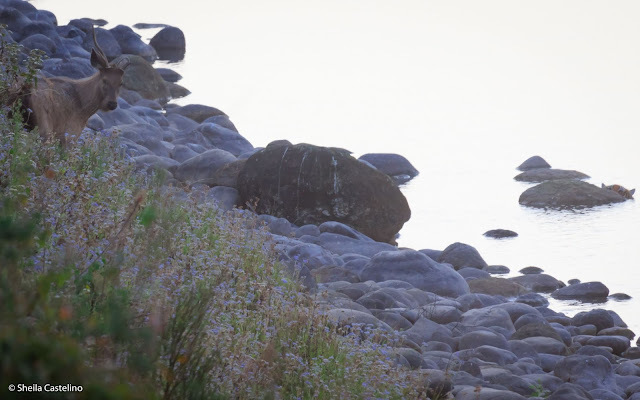 Wasim told me, "ma'am keep your eyes and camera focused on the three small boulders in the water. 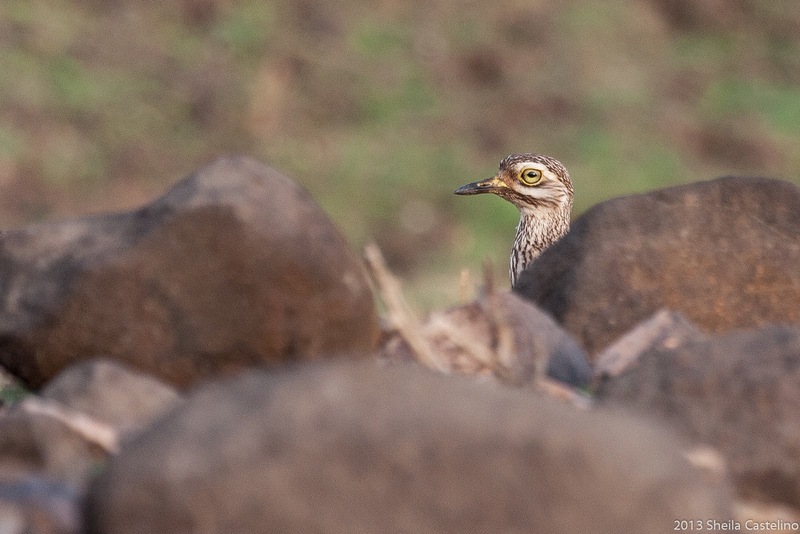 When the sambar deer gets close enough, she is going to pounce." With blind faith, and blind eyes! (that is what happened to me, when the setting sun was shining right in my eyes), I kept my camera focused at the spot pointed out by Wasim. 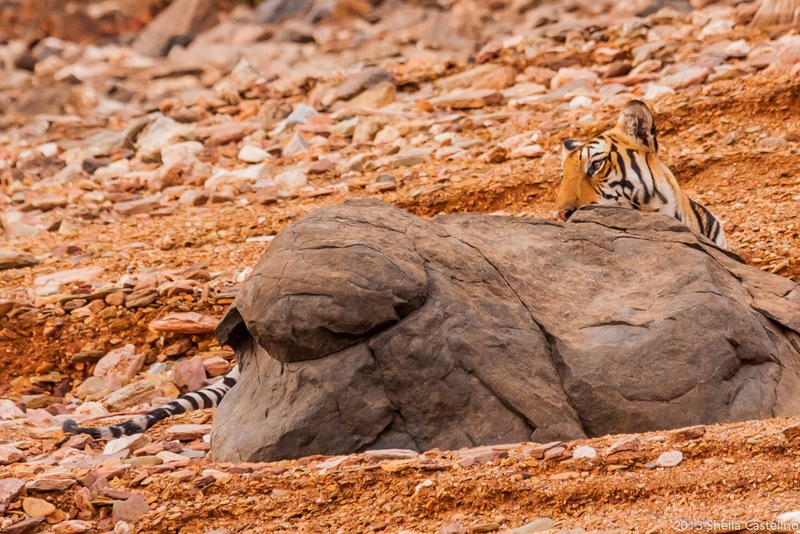 Mind you, I still could not see the tigress. The wait, the tension and the excitement was building up. In the next few minutes, this is what happened. 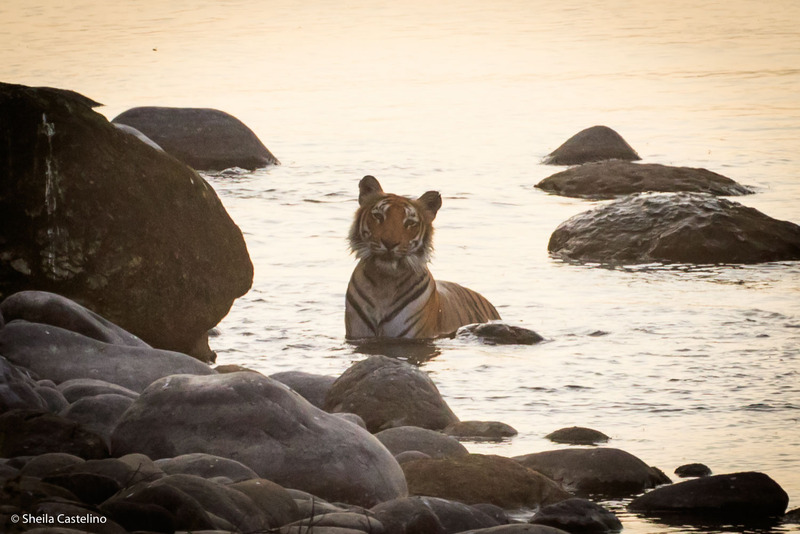 As the unsuspecting Sambar moved closer to the waters edge, Paarwali watched her intently from her hiding place. 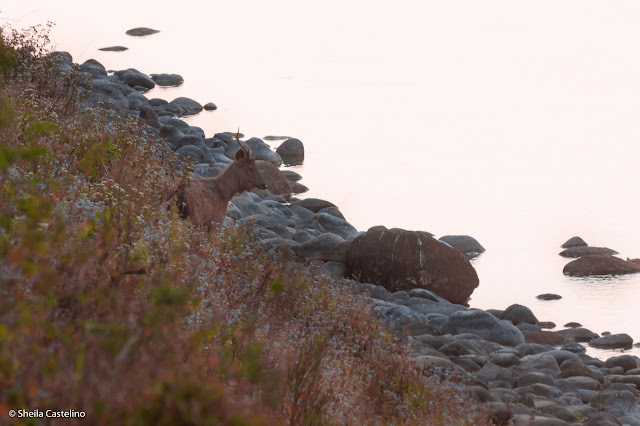 Since she was underwater, there was no smell to warn the Sambar deer. The deer moves closer. The tigress makes another smart move .... Now you see her now you don't! Where has she gone? A few moments later - WOW !! 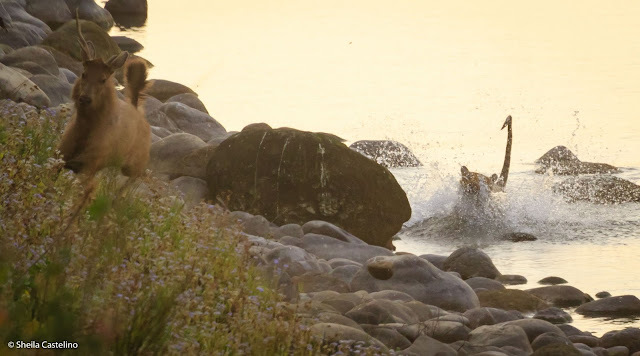 - from behind the bigger boulder - a sudden BIG splash! 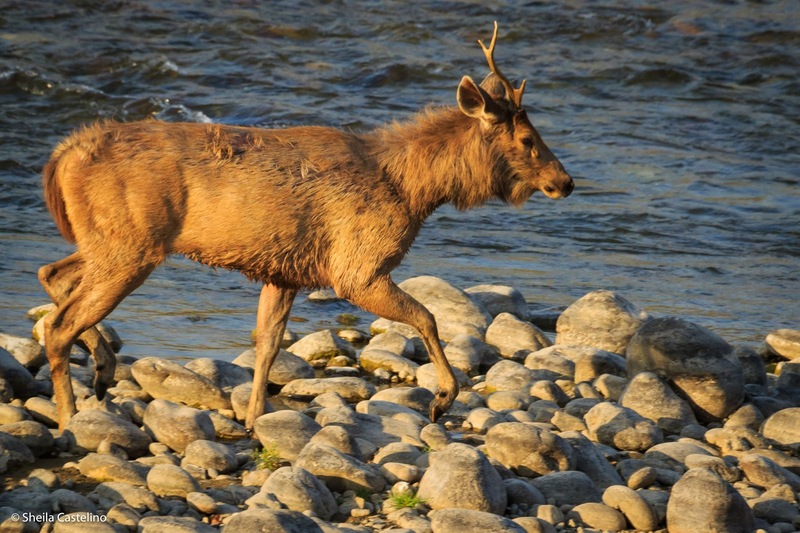 The Sambar sees or hears the splash, and within split seconds turns and runs. ..... while Paarwali watches in despair, realising her sumptuous meal is getting away - she gives up the chase. She realises, she misjudged her timing. She has a look of frustration. So near and yet so far. She smacks her lips at the lost treat. Ah! well ... tomorrow is another day, she seems to think, with her tongue hanging out. Totally disappointed, she turns and moves away in the other direction. 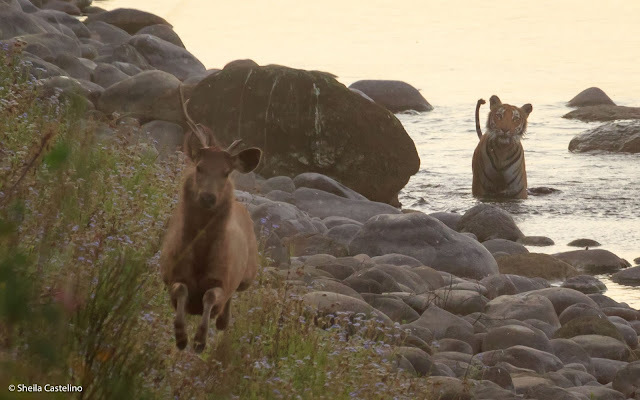 The lucky Sambar, now at a safe distance from the tigress lives to see another day. 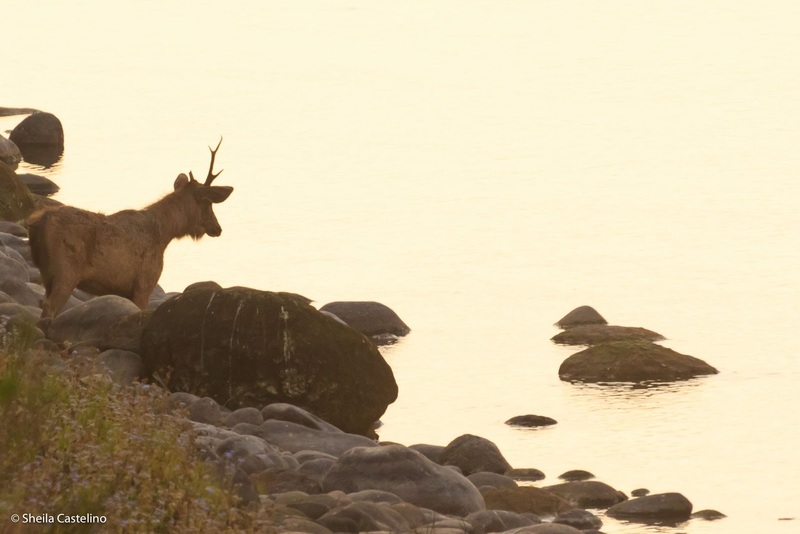 He trots to the river's edge and has a drink of cool water to quench his thirst. In the wild patience pays. Sometimes being last pays too. One never knows what drama is out there waiting for us. 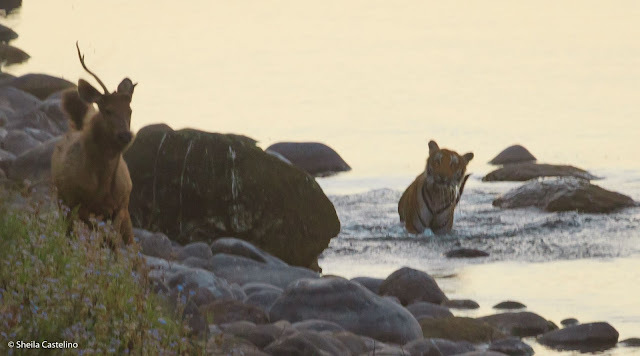 Though the morning started out with a bit of a disappointment at missing the tigress sighting, it finally ended up being a memorable and exciting day for both Jugnu and me. An encounter to share with our family and friends. (Though I could not get clear and sharp pictures, thankfully I did manage to capture on camera the whole experience that unfolded before our eyes). The rolling grasslands dressed in a golden hue, swaying in the gentle breeze. Spread across the wide expanse of the Savannahs, interspersed with a few Acacia trees. 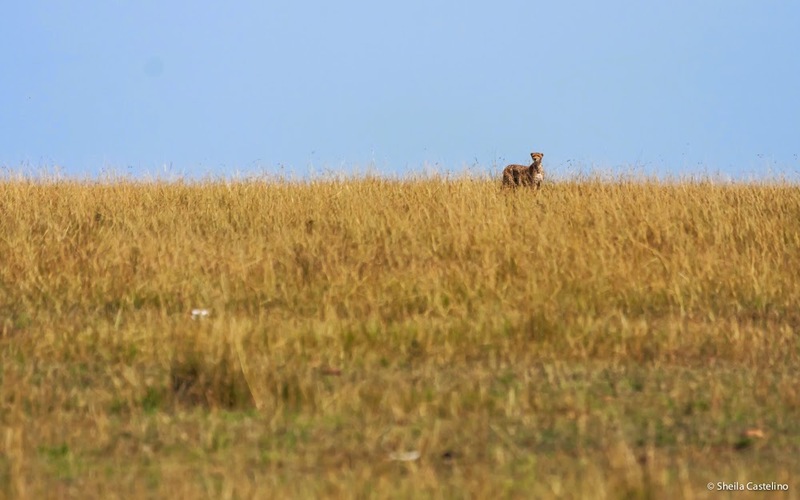 This was the Masai Mara landscape, where we had already spent five days in September of 2012. 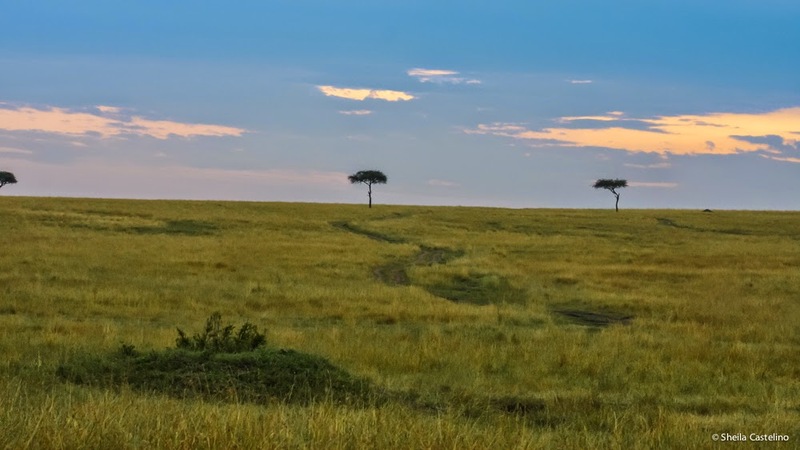 The wide expanse of Masai Mara grassland with a few Acacia trees at dusk. 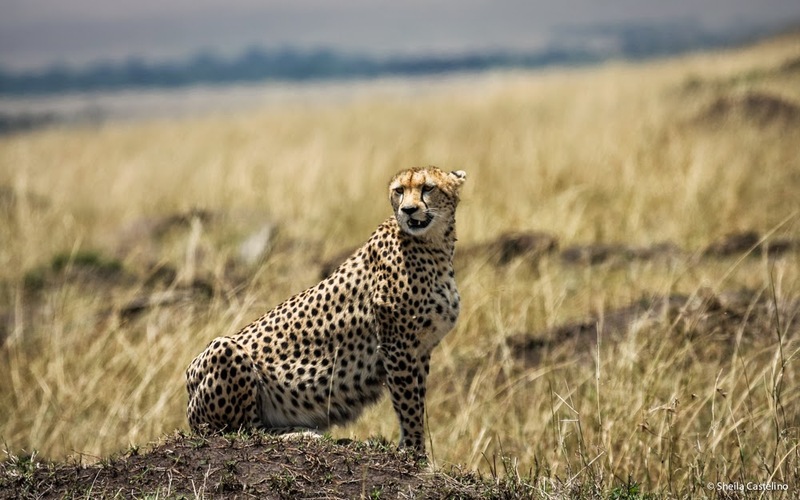 We had seen an abundance of wildlife - lions, cheetahs, leopards, elephants, wildebeests, zebras, topis, gazelles, giraffes, white rhinos, hippos, bat-eared foxes, hyenas, numerous birds of different colors, shapes, and sizes, the list could go on. 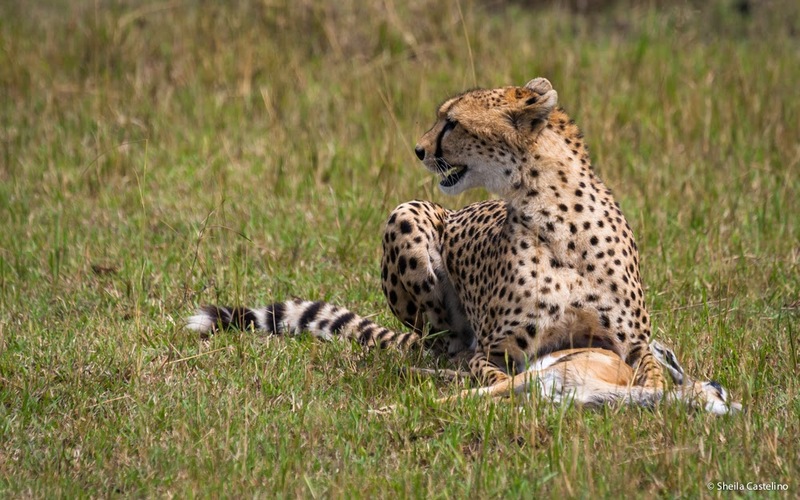 During our stay, we were also fortunate to see two cheetah hunts. My first experience of such a hunt in the wild. It was educative, exciting and exhilarating. 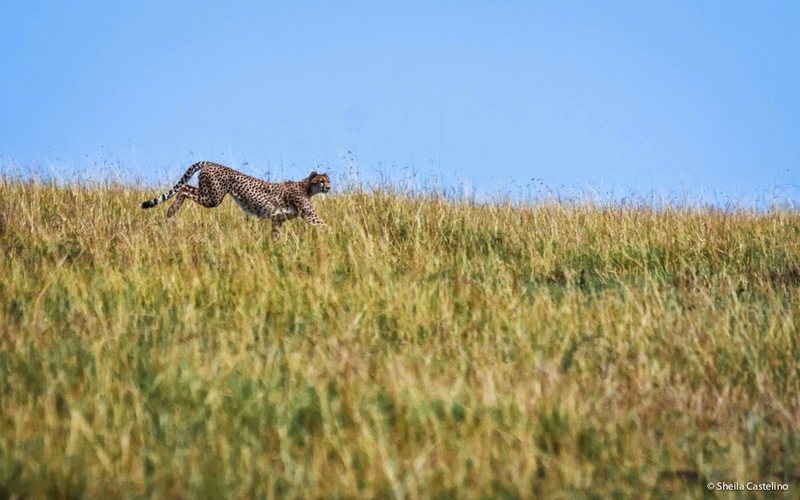 Cheetahs typically hunt gazelles, impalas, young wildebeest and zebras. All these animals live in herds, and are on a constant look-out for any approaching danger. Cheetahs often isolate their prey, picking one of the younger beast in a herd, or one that has moved away from the herd. Once the prey is isolated, it moves slowly, stealthily, towards the unsuspecting creature. When the cheetah is close enough, it sprints with lightening speed, trips the animal with it’s fore-paws and goes for the neck, biting firmly, not letting go the struggling creature. 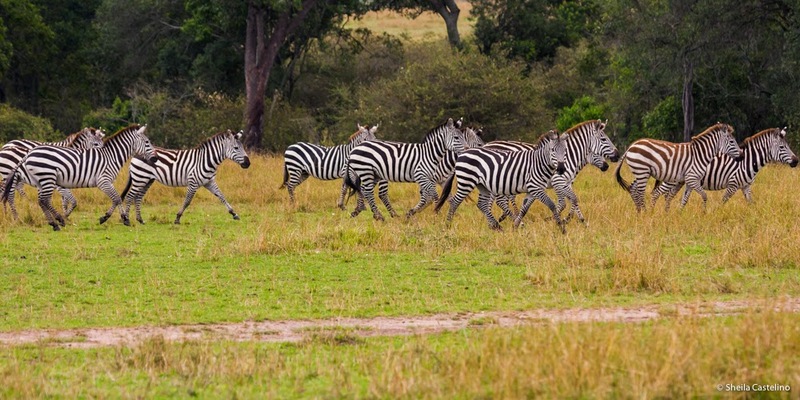 A small herd of Zebras. Cheetahs have poor night vision. They hunt by sight, not by smell. Therefore, unlike other big cats they are diurnal. They hunt early mornings or late afternoons, using the usual hunting tricks of hunters. They move low in the grass, keeping themselves pretty well hidden. 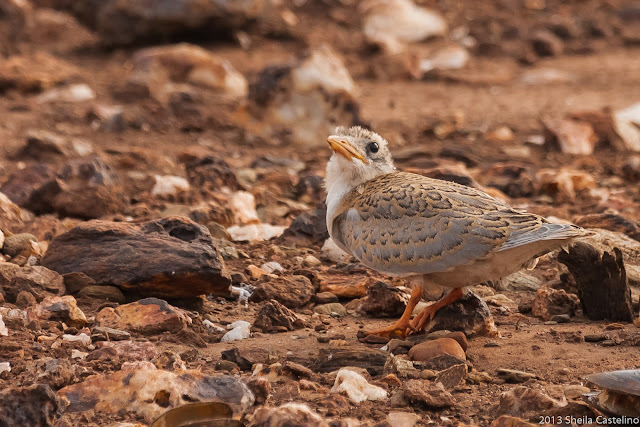 Their colour and spots aid in camouflaging them well. Their approach is from downwind, to ensure the prey does not get their scent. If they do, they are sure to bolt. 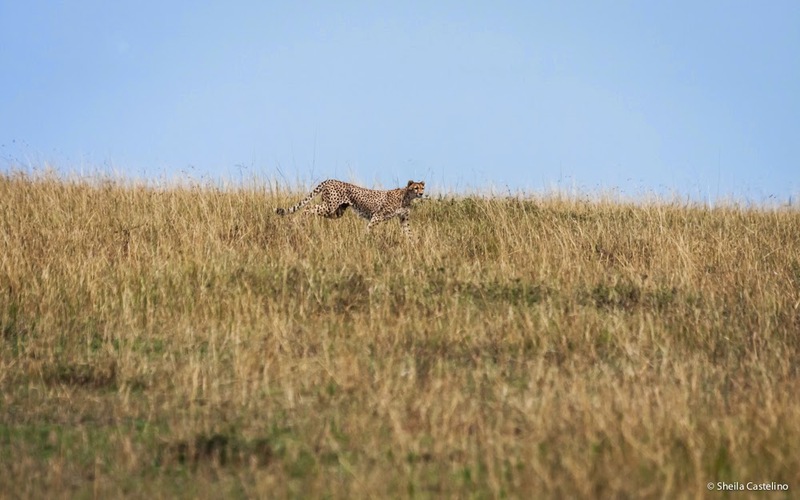 Cheetahs look for mounds or small ant hills in the undulating terrain, to help them get better cover and viewing position, in their search for prey. 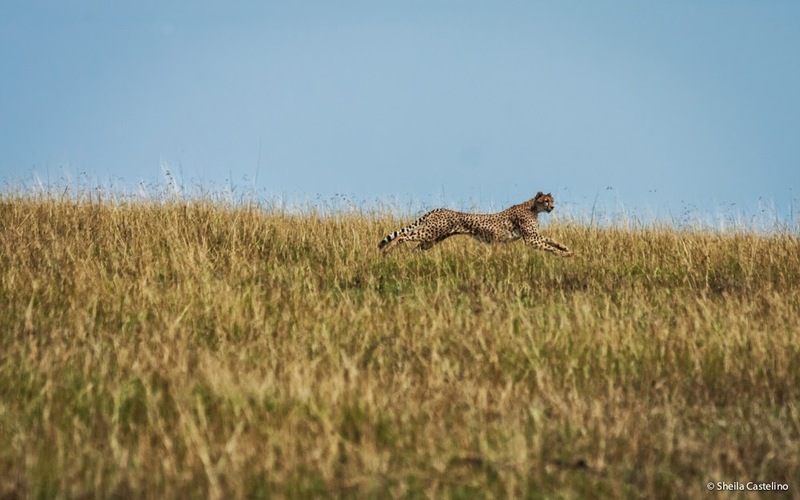 They are the fastest land animal, capable of short bursts of speed, reaching approximately 110 kmph in a few seconds. 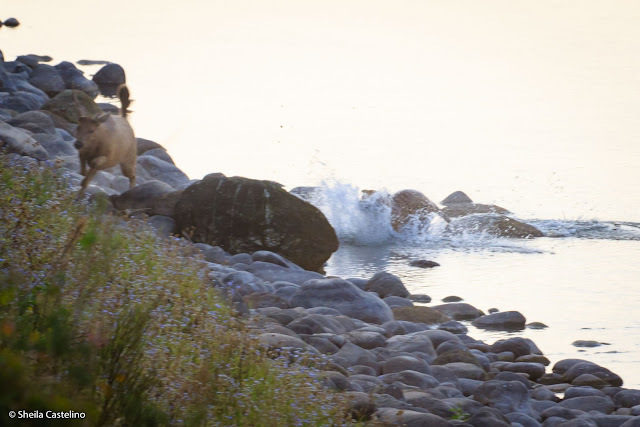 They tire easily after a short run at such speeds, and have to rest after each chase. Hence the need to get quite close to the prey. Their success rate is one in every ten hunts. 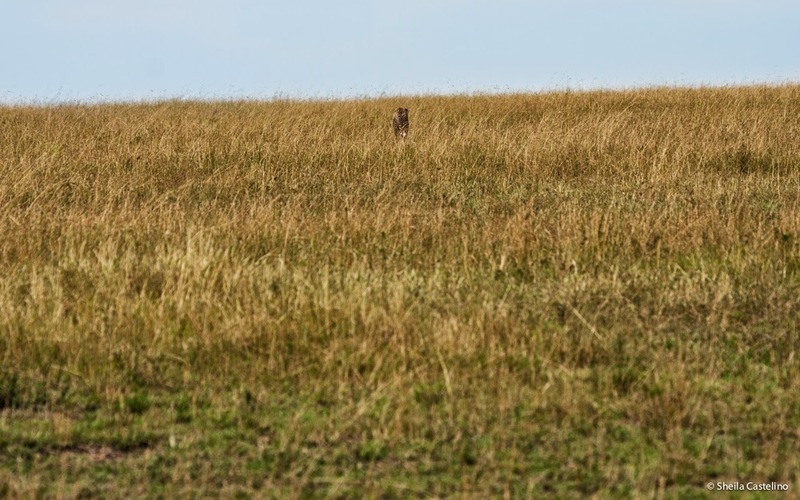 A cheetah's vantage point- a small mound from where she can survey the area searching for prey. 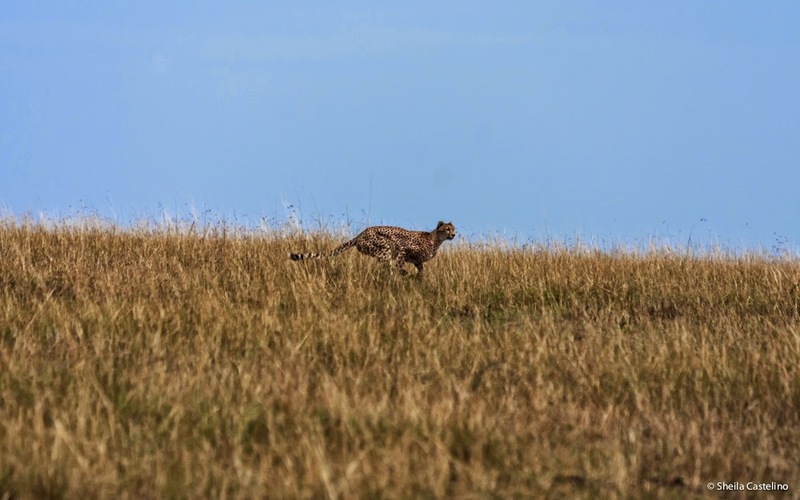 September 10, 2012 - It was our last day at Masai Mara. 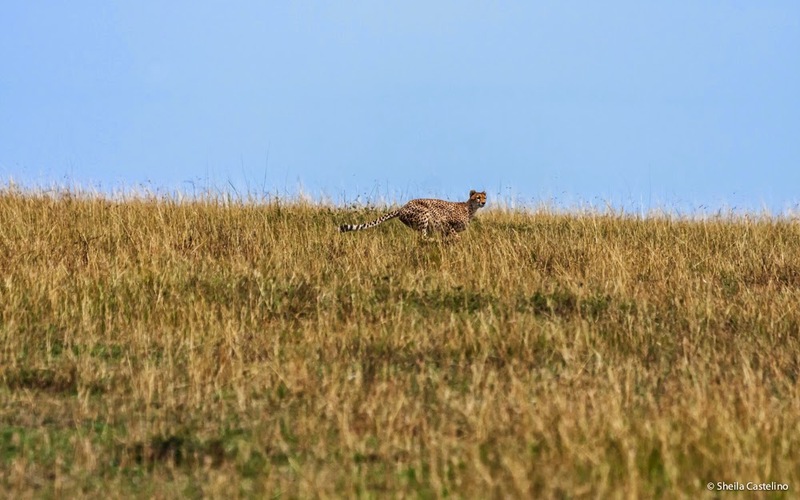 What better way to say adios to the beautiful Masai Mara, than to witness another hunt. So boldly I told our guide, “Hey, Wilson, I want to see a cheetah hunt today. Its our last day at Mara, you know”. He looked at me in disbelief, and said, “You have seen two hunts already. Most people are happy and lucky to see one”. I smiled and replied, “Well Wilson, I really want to see another hunt, and I know you are going to show me one, before I leave”. He smiled, but shook his head at my audacity. I smiled back in hope, and let it pass. We continued our safari. 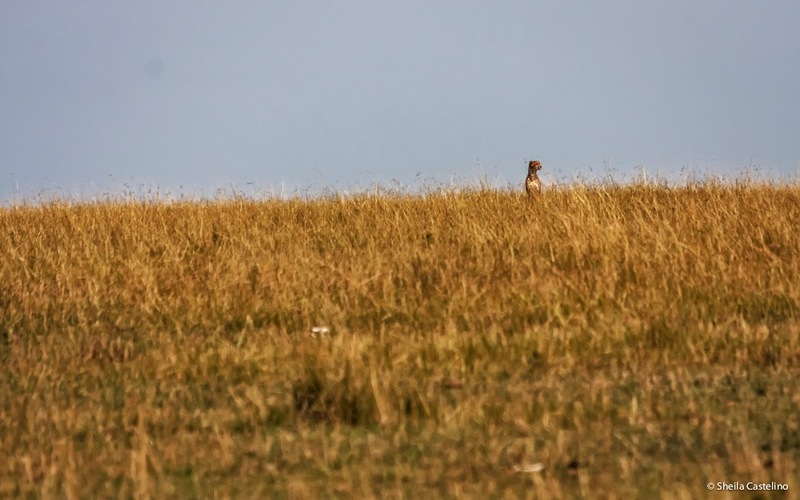 A little while later, he called out to our group: “Look, look, there, a cheetah.” Straining my eyes, I did see in the tall grass a small blur, at a distance. She was blending in so beautifully, it was difficult to spot her at first. Once spotted, I kept my eyes locked on her. There in the distance, in the direction pointed out by our guide Wilson, I spotted a small blur. She was moving slowly, softly, stealthily, keeping herself well hidden in the tall grass. We realized she was searching for prey. Keeping herself well hidden in the tall grass, she was searching for prey. 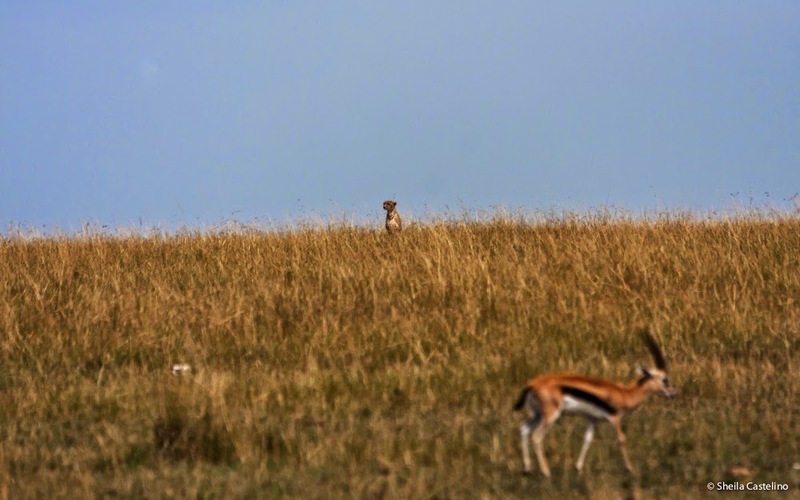 From her vantage point, she spotted a lone gazelle. She was watching from a downwind position, and hence her scent did not carry. 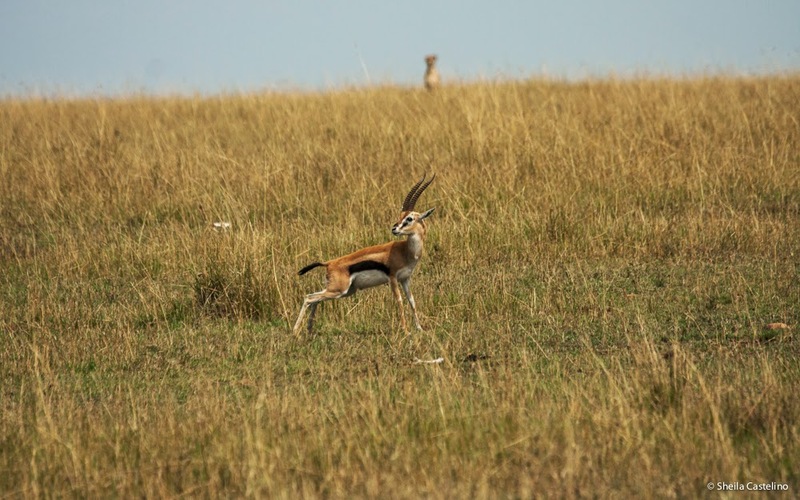 The gazelle was unaware she was being watched. 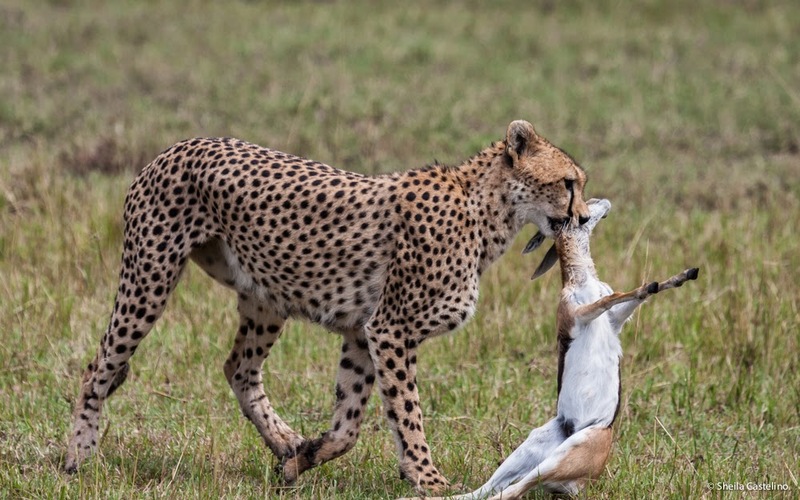 The poor gazelle, looked around, but was unaware of the cheetah's presence. She sat down to answer nature’s call. After relieving herself, she moved away. ..... and having finished, slowly moved away. The cheetah from her vantage point, looked to the left, looked to the right, surveying the area in preparation for her next move. She moved forward, slowly and stealthily getting closer and closer to her prey, all the time watchful of other predators. .... slowly and stealthily she started moving forward, getting closer and closer. Once she felt she was close enough, she sprung forward with lightening speed! 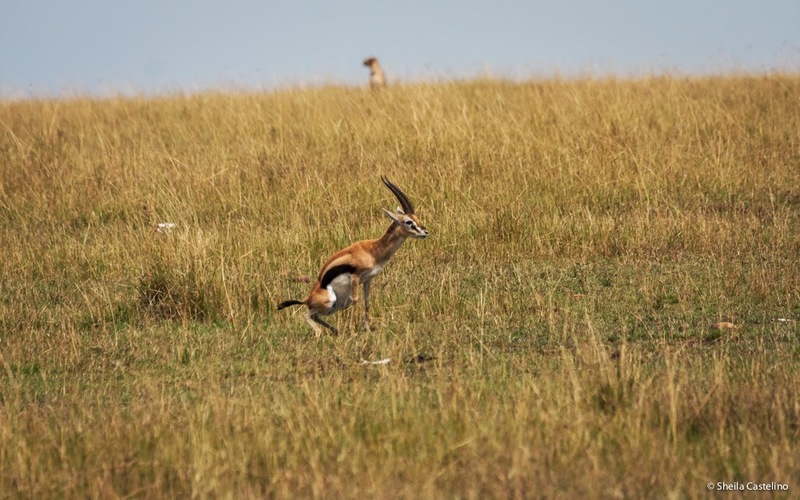 With her feet hardly touching the ground, running with a burst of speed, she reached the gazelle within striking distance, in less than a minute. .... with her feet hardly touching the ground. 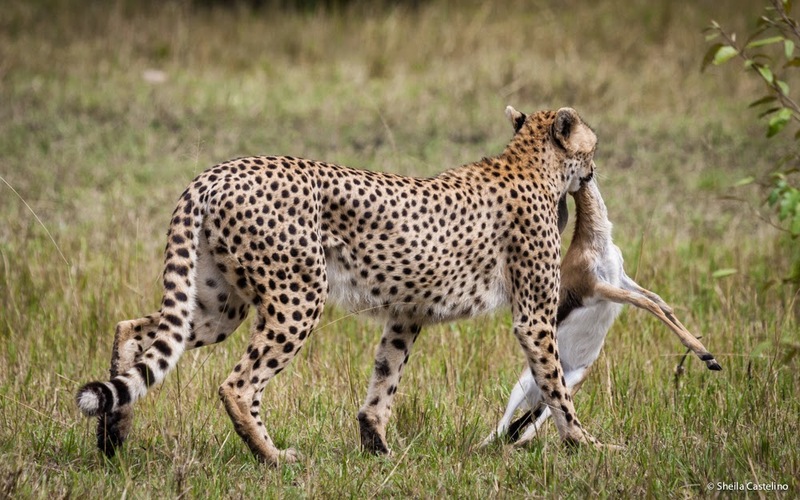 With a final leap, she captured the gazelle and dug her canines into the gazelle's neck. I missed the shot when she first caught the gazelle. It all happened so fast. The speed, the excitement, the thrill of seeing my wish come true. Once she had captured her prey, she sat down and would not let go. The hapless gazelle hung listless, her life slowly ebbing away. 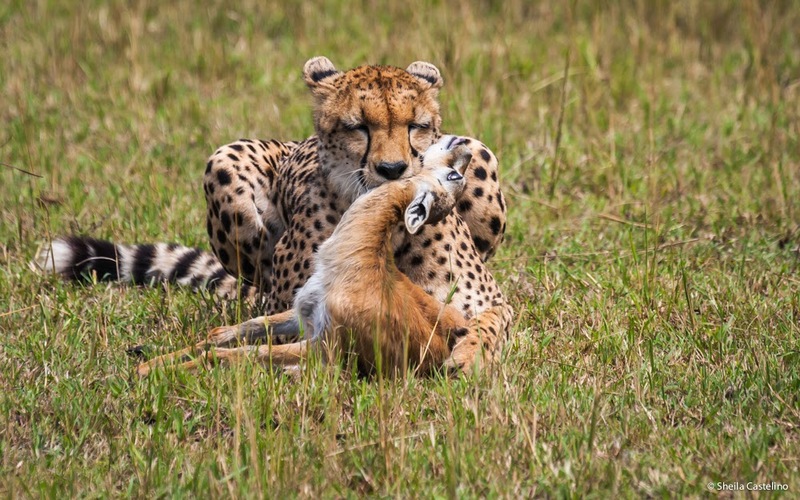 Cheetahs are among the smallest of the big cats, and have to be wary of other bigger cats, relieving them of their kill. Lions, leopards, or even scavengers like the hyenas can rob them of their food. 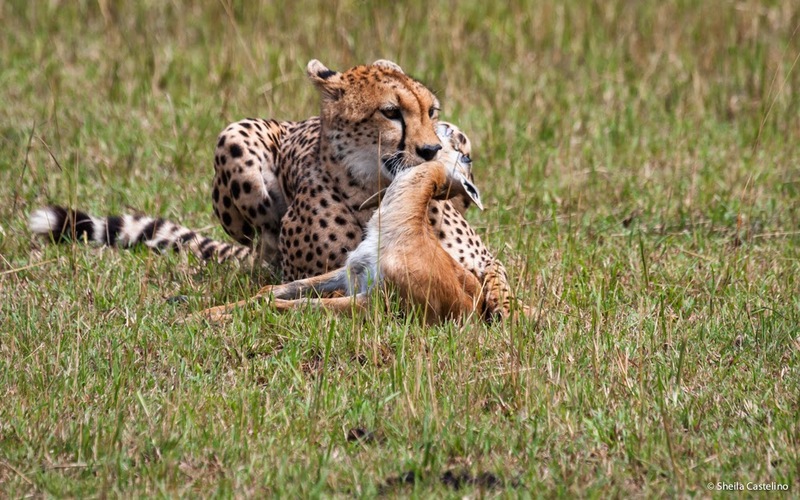 Sometimes, cheetahs do not even wait for the prey to be dead, before they start eating. Once they finish eating, they do not go back to the kill. Before feasting on her prize, she is careful, and looks around to see if there are any predators around. She sees a shrub nearby. 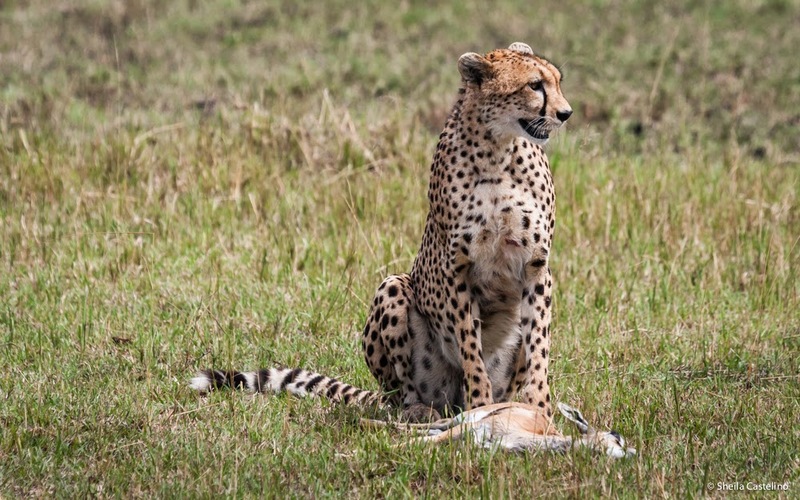 Not wanting to take a chance, decides to move her kill behind the shrub to provide some kind of a protection or hideout, before sitting down to enjoy her meal. .... and decides to move her prize, before indulging herself. 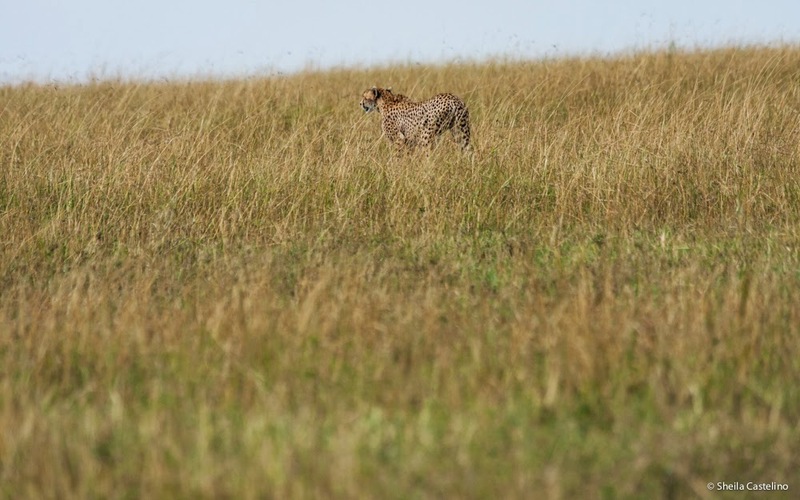 My wish of witnessing another cheetah hunt before leaving Mara came true. When you really wish for something, chances of that wish being granted are quite high! We can never know, when nature favours us with exciting and memorable moments in the wild. It often happens when least expected. Sharing with you one such experience. On a chilly morning, early in March 2012, five friends (Sandeep, Vimal, Arun, Meera and me), were on a safari in Kaziranga National Park, Assam. A couple of hours had passed. 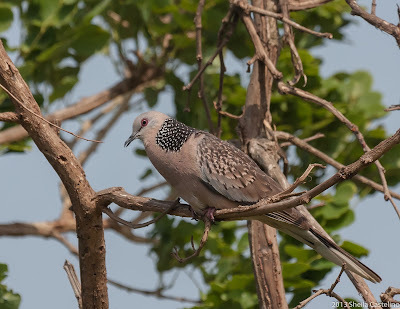 During this time, we had sighted many birds and beasts! large and small! Captured them on camera too. 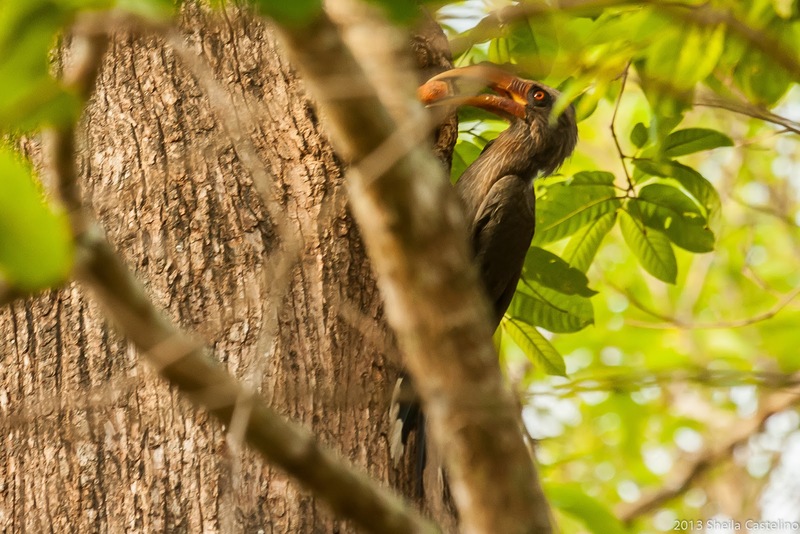 Some species we sighted for the first time, while others were repeat sightings. We were happy and content with both. We continued our drive along the river. After sometime, we stopped at a view point. I wandered along the river bank. In the distance, I spotted a dark brown blob on the small island in the river. The brown blob on the island. 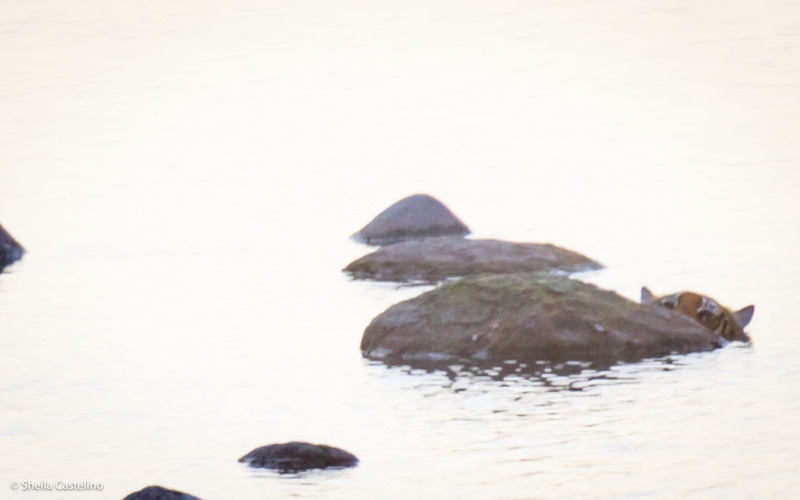 On closer look through my binoculars, I found it was a River Otter. He stood up, looked around, probably to see if there was any danger lurking around. He seemed satisfied. Looking around to make sure it was safe to relax. 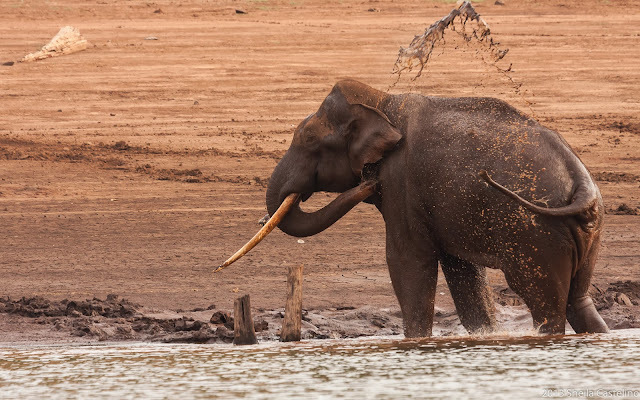 Soon he settled on the mud bank to soak in the morning sun. Little did he or we know what was in store next. Time to relax and soak in the morning sun. 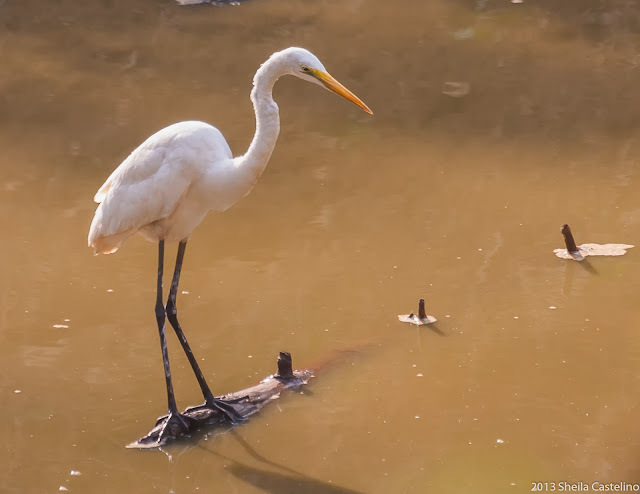 We continued sighting and photographing other water birds around from different vantage points. About ten minutes had passed. Suddenly, the poor otter was jolted out of his reverie. Looking up to see what had caused this panic, I got the answer. 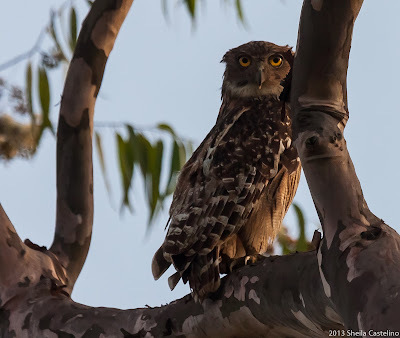 He had spotted a Grey Headed Fish Eagle. The alert otter spotted the eagle. The eagle swooped down towards the otter. ...... with a great big splash. With a great big splash, the otter dived into the water as fast as his little legs could carry him . All the while his eyes followed the movement and path of the eagle’s flight. The eagle could not catch him. The eagle missed his meal, while the otter saved his life. He watched with relief as the eagle flew away. Little Otter had had a narrow escape! The otter watched as the eagle flew away. The otter, now ever alert, was watching the eagle, not letting down his guard even for a moment. Down flew the eagle once again on the same flight path. This time the eagle was lucky. No, no, he didn’t get the Otter for a meal. The Otter had outwitted him. His catch was a huge river fish, most likely a rohu. Clutching his prize in his strong claws, he flew with satisfaction, looking for a place on the river bank. He found one, settled down to devour his meal. .... looks like he found a place to enjoy his catch. 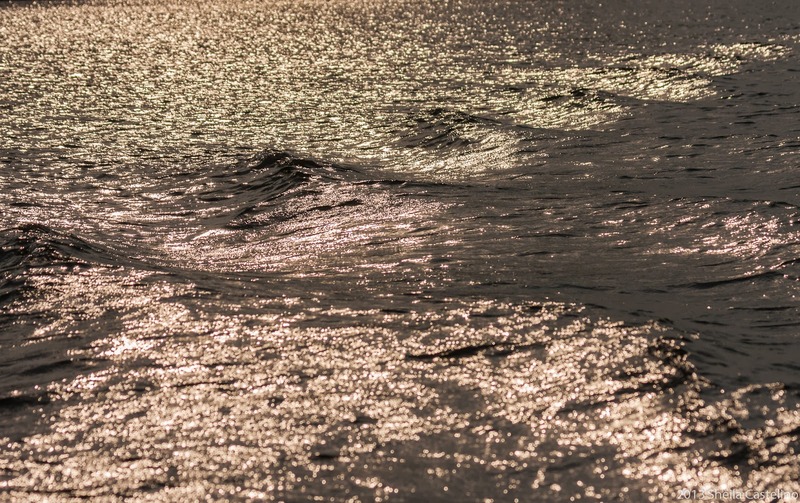 It was high drama on the river bank, something that held us spell bound. We watched this whole drama unfold from the river bank from different vantage points on the river bank. We were some distance away - all this was happening mid river. I could not capture clear images, but did manage to capture the essence of the moments witnessed. Dates were finally finalized!! My friend and I were all set to go to Coorg, something we had been planning for many months. But, unforeseen circumstances, and at the last minute plans had to be cancelled. I was already in the travel mode! What to do? Ah, my friend Shree to the rescue!! So off went an SMS … Do you have a spot for me for the Bhadra trip ? Back came a positive reply. Happy me, and in a jiffy, I was all set to change course towards Bhadra River Tern Lodge. 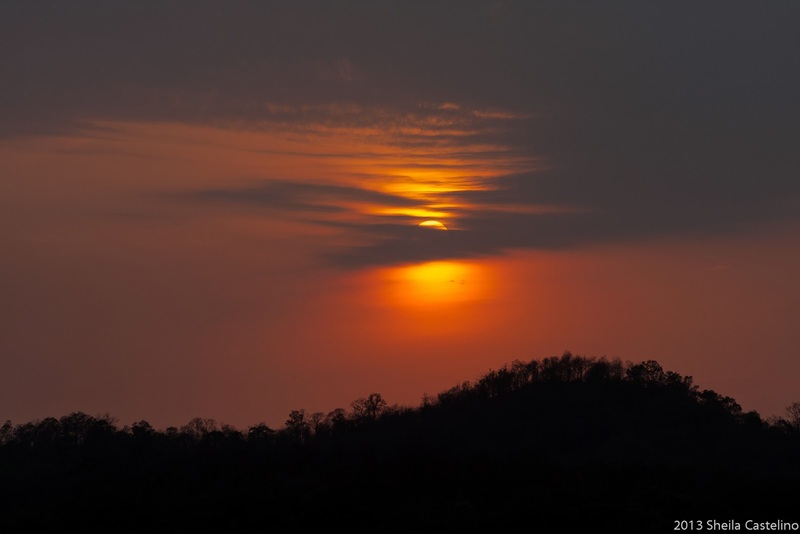 What will Bhadra have in store for me? 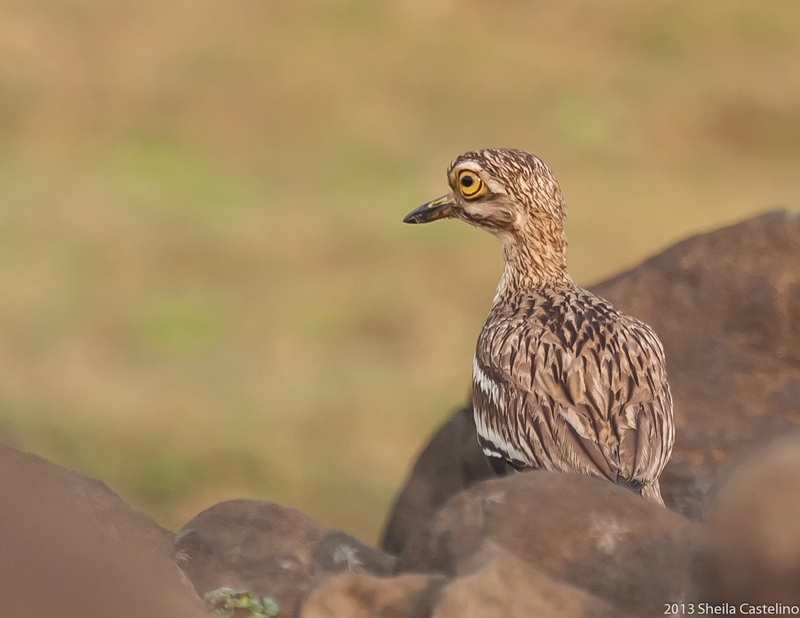 Early morning on May 3rd, a group of six of us with Shreeram of Darter Photography, as our team leader, were on our way to the River Tern Lodge, at Bhadra. Reaching there just before lunch, we checked in, a quick bite and a little briefing before setting off on our first safari of the trip. Shree said it would be the boat safari, best way to see the River Terns. As we reached the shore, what an abundance of the terns. I had never seen so many in one place. 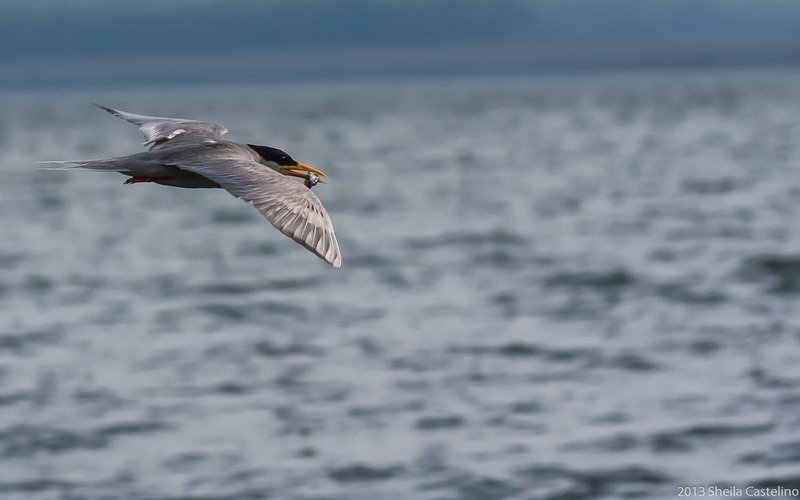 Flying about, diving in the water to catch fish, feeding chicks – it was frenzy of activity alright. 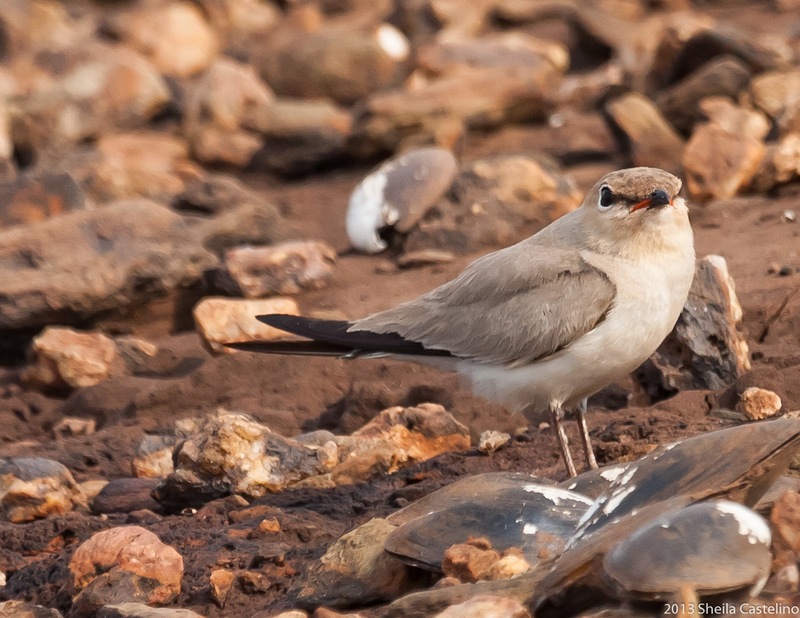 In addition, we also saw small pratincoles. And some river tern chicks. 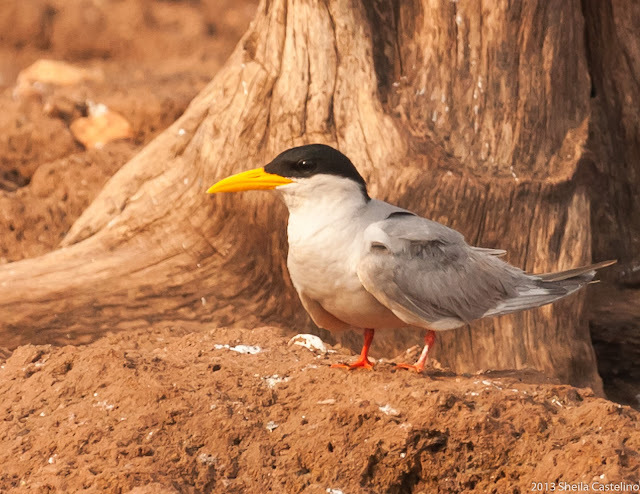 River Tern with a catch of fish in its beak! 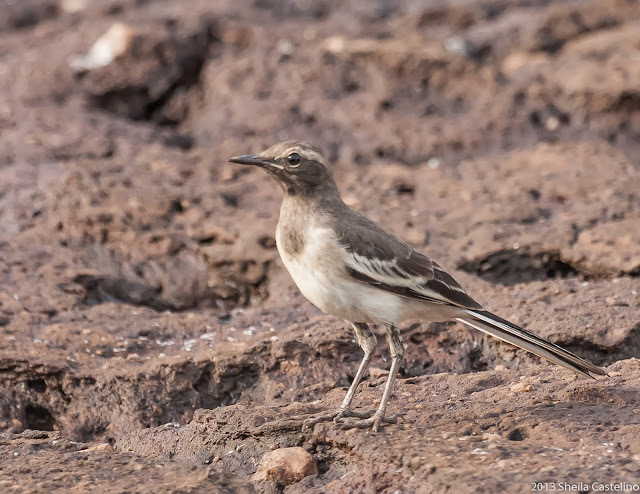 We looked around, and there was a white browed wagtail!! Not to be outdone, it sure was making its presence felt by flitting from one place to another. After a while we headed in a different direction. 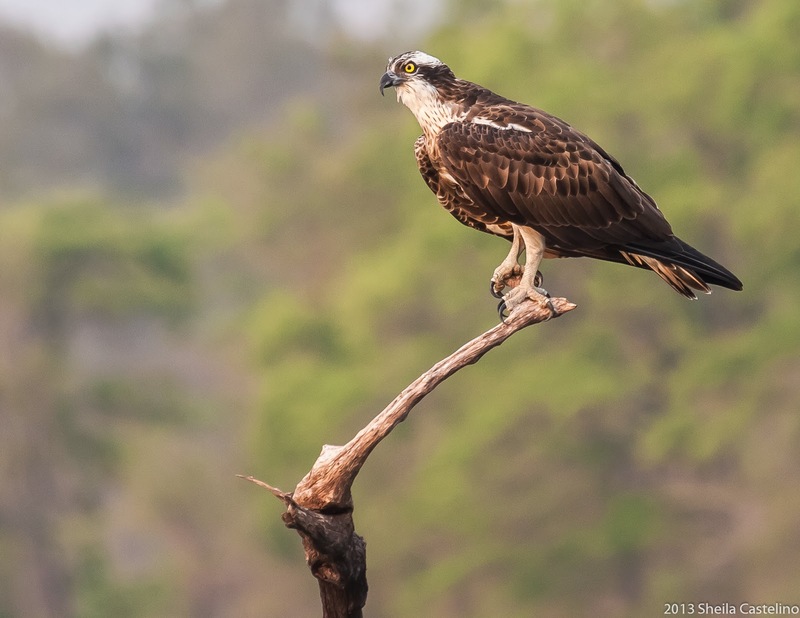 And lo and behold, there was an Osprey, perched majestically on a dry branch. Would he treat us to his skills of fishing! Or was he done for the day? Dusk was soon approaching. Time to move on, and head back. Happy at all the sightings, we were enjoying the beauty of the setting sun, and the shimmer cast on the waters of the Bhadra River. At the far end of the bank, our guide spotted a huge ‘dark boulder like image’. 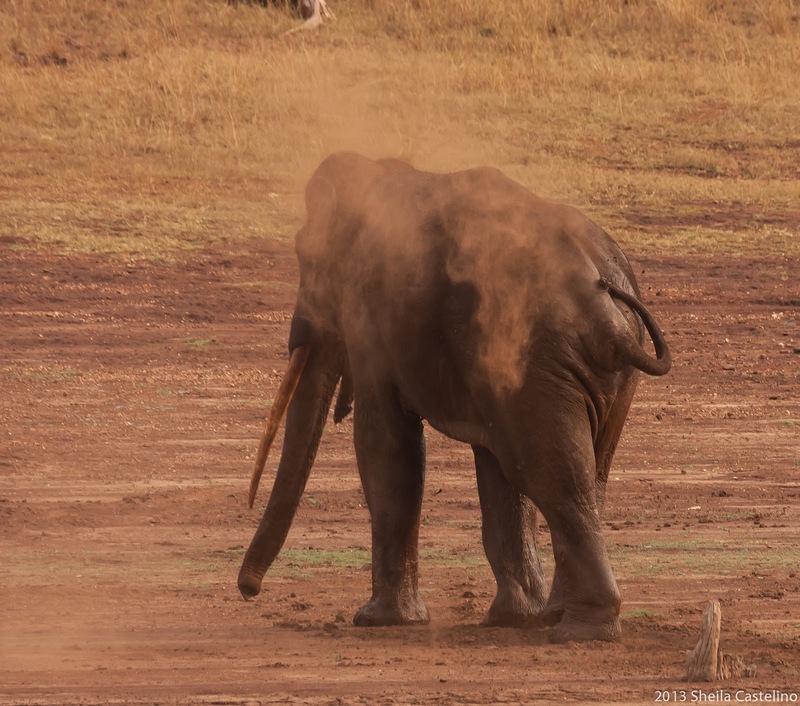 As we neared, we saw it was an elephant lying down. “Is it injured?”, “What happened'? "why is it lying down”? – were some of the questions asked. 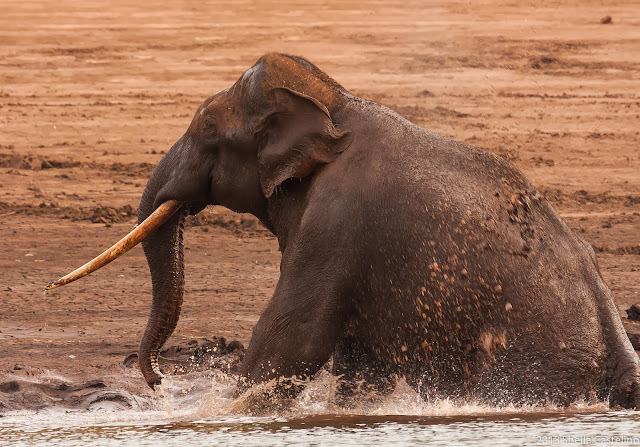 Suddenly the elephant stood up, a sigh of relief in the boat, the elephant was just having a nice evening bath, using the river, as a big bath tub! .... and finally ‘powdering’ itself with the red mud,as it moved into the forest. 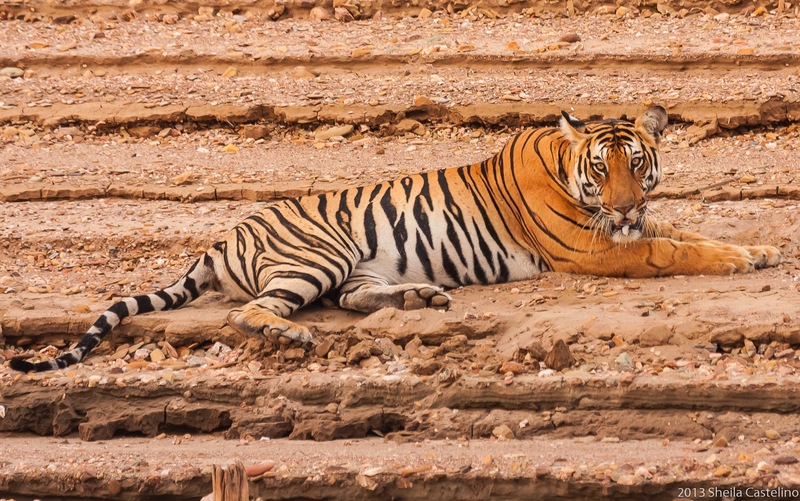 Wonder of wonders – there was a tiger, relaxing at the banks. 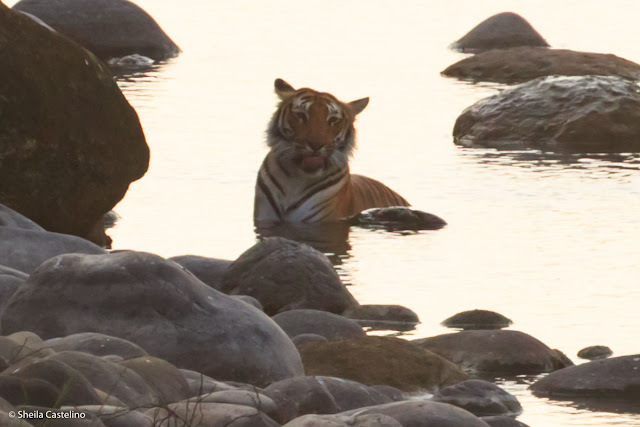 We were with the tiger for more than half an hour. It was getting dark! and we had no choice but to head back. Nature had truly us treated us to its many wonders on our first day, first boat safari at River Tern Lodge. WOW, what a fantastic end for the day. My first sighting of a tiger on the banks of a river. It is a totally different experience from sighting it in the forest from a safari jeep. The third safari was again an evening safari on the boat. Lots of cormorants, river terns, small pratincoles. The sunset! Another good day. For the last Safari, there was a choice of jeep or the boat. At first I thought I would go for the boat safari, but at the last minute I opted to go for another jeep safari. Again, we had a many different sightings. 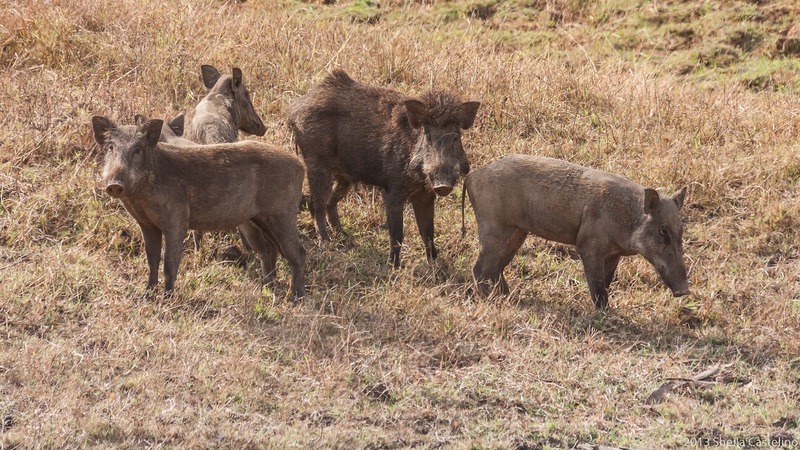 and last but not least, with quizzical looks, a family of wild boars. 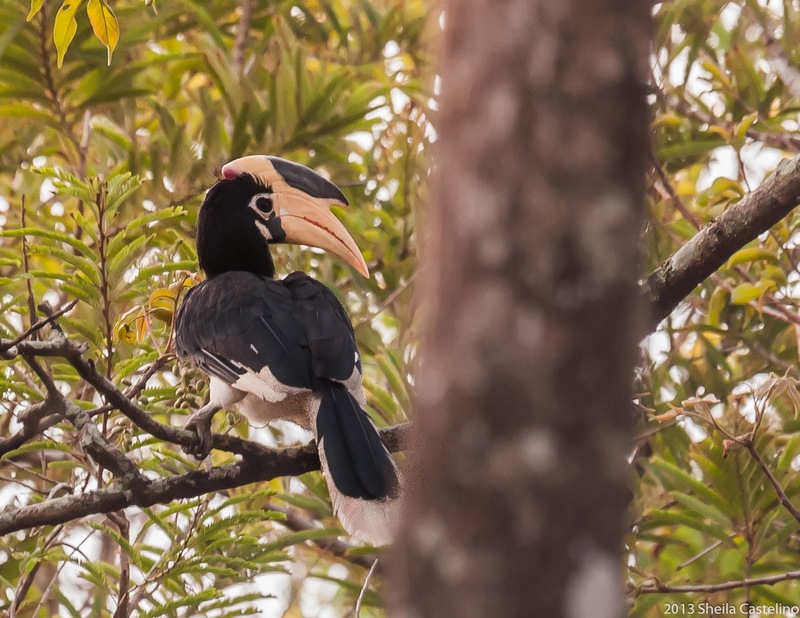 It was an amazing trip and a wonderful learning experience with Shreeram of Darter Photography, who patiently and painstakingly explained photography and wildlife. To capture it in one line – "The wonderful wonders of nature never cease to amaze those of us who have the patience to wait till she decides to surprise us. " Though I travelled a fair amount in my younger days, they were mostly restricted to family visits. I caught the travel bug a little after I’d spent fifty years on this planet. In 2000, I got an invitation from my aunt in London - to take a break, visit her and see the sights. Due to various commitments, I took a rain-cheque. In 2003, encashing the rain-'cheque’ I went to London. My brothers in Montreal heard of my plans & invited me to visit them. I spent a wonderful month in both countries. On return, I shared my stories & experiences with family and friends. "Write a journal, share your experiences with others", they exhorted. The next year, I visited my son in Philadelphia and my brothers in Canada. While on holiday, I wrote daily, descriptive emails to family & friends. Again, I heard the same refrain - "Have you started a journal? Write! Write!" I am happy this travel bug hasn’t left me! I'm happier to let the bug ‘live’ within me, egging me on to travel like never before. The constant refrain from family & friends hasn’t left me either. Ten wonderful years of travel later, here I am, finally with a bog. Thank you one and all, for your encouragement and good wishes.